The world of folktales narrated amidst rich nature. Kobutori jiisan, the old man who had his wen removed by demons; Hanasaka jiisan, the old man well-known in the children’s song that goes, “Pochi, the dog, is barking in the back garden …,” and who made the tree bloom; frightening but somehow humorous tengu, half-man, half-bird creatures with a long beak and wings; the old bamboo cutter who brings up Kaguyahime, the Shining Princess; and Kintaro, who played with a bear. Folktales are a wonderland frightening but fun and full of thrills. In Ogurayama in Nikko, where Kosugi Hoan played as a child, even today, there are still places that make you feel tengu might be dancing or Kintaro might be playing sumo with a bear. The nature in the world of folktales truly remains. 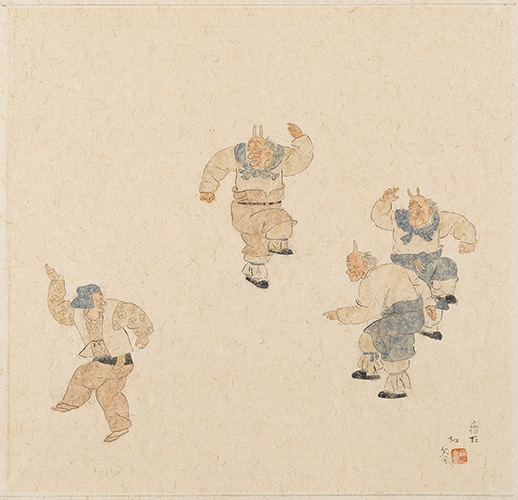 Kosugi Hoan’s recollections of his childhood were connected to such a world of folktales.